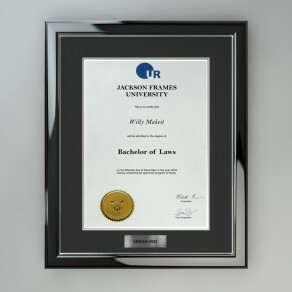 Our range of corporate frames are ideal for professional documents, admissions and certifications. Each frame comes in a range of finishes and styles to enhance, preserve and display your achievements. We can even work your company logo into the design for that extra bit of branding. Choose from our most popular style combinations for your professional frame for certifications listed below, or select a particular frame style and customise your professional frame to suit your office decor. Highly polished rosewood timber finish with one gold line on the inside adjacent to the glass .. 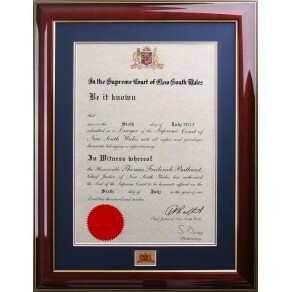 Highly polished rosewood timber frame with one gold trim line on the outside edge and two on the ins.. Highly polished rosewood timber finish, with three gold trim lines on the outer edge, one gold line ..
A simple no fuss matt black timber frame if you require a different frame moulding dimension .. Highly polished black piano finish with two gold trim lines on the outer edge and one on the inside .. Majestic Gold frame with navy/gold double mat and emblem to showcase your Supreme Court admission. ..